In episode 59 of the Pixar Post Podcast, we share our complete interview with Incredibles 2 writer/director, Brad Bird and Producers Nicole Grindle and John Walker. Along with the interview we share our thoughts on our two-day visit to Pixar Animation Studios earlier in April to discuss the film. We talk about many of the insights and details we learned as well as our high-level thoughts on the 22 minutes of footage we screened. Throughout the podcast, you'll learn about many details of the film's process, from the reason why the Incredibles family has the powers they do, to why the film swapped release dates with Toy Story 4. Additionally, you'll hear as we inquired which returning vocal actors (and which new vocal actors) really knocked it out of the park and why the film didn't have a time jump (since it picks up right where the first film left off). Oh, and have you ever wondered if you'll see Honey (Frozone's wife) in Incredibles 2? Listen for all the fantastic details. Check out our other recent Incredibles 2 posts using the related posts below — learn more about the wannabe superheroes and go even deeper into the film's background and characters. Additionally, chat about Incredibles 2 with other Pixar fans in the Pixar Post Forum dedicated to the film. 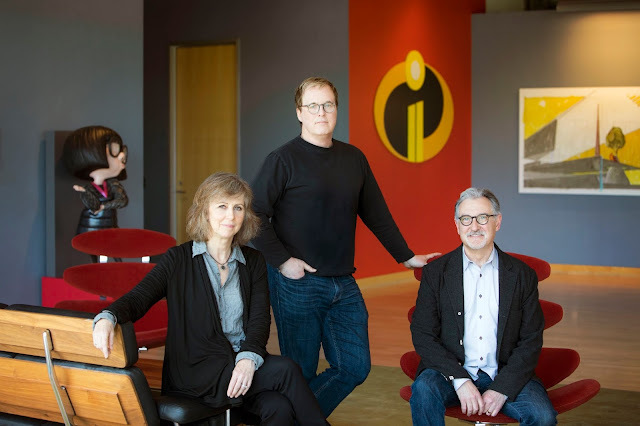 In our recent interview about Incredibles 2 with Brad Bird, Nicole Grindle, and John Walker, we were lucky enough to listen in as the trio went behind the scenes about the film. Listen to the full interview here to find out why this wasn't a cash grab for the studio.